News - WAKFU, The strategic MMORPG with a real environmental and political system. Season 3 of WAKFU is finally coming to Netflix worldwide tomorrow. Come help us out with it! It's finally Friday the 6th of April, the most suitable date for a launch, that season 3 of the WAKFU series will be available on Netflix worldwide. This will allow you to fully enjoy the weekend of the Fleaster Egg Hunt and collect a lot of treats to enjoy in front of your upcoming episodes! With only a few days left until April 1st and the international release of WAKFU Season 3 on Netflix, between Tuesday, March 27 and Wednesday, April 4, we're offering you the chance to win a Netflix subscription and other prizes on Twitter and Facebook! To accompany the worldwide release of WAKFU: The Series on NETFLIX on April 1, 2018, ANKAMA is developing a new adventure game for mobile devices. It's the perfect way to discover the extended KROSMOZ universe that WAKFU is a part of – a mix of animation, video games and graphic novels. After a very successful release on French television and Netflix France, WAKFU Season 3 is finally arriving on Netflix globally! Trick or treat? For fans of the series WAKFU, the coming weekend will be all treats! For two days, on October 28 and 29, the three special episodes can be streamed for free on Steam! This spring – when eggs hatch and flowers bloom – Season 3 will be available on Netflix. Until April 2018 rolls around, the long nights of fall and winter will be perfect for watching (and re-watching) the previous seasons and special episodes there! In just a few months, Season 3 of WAKFU finally comes to Netflix! This waiting period is the perfect time to put your creativity to the test (and maybe hold you over for a bit…)! We've all been working out a gazillion theories about what's in store for the brotherhood, and it's time for you to draw your predictions for us! If there's a new site, there must be new news! With this new source of news, we can't forget about our poor old social network pages! With Facebook, Twitter, and Tumblr, you can be sure you won't miss a single mention of our dear Brotherhood! Since its first issue, Gamakna, the digital magazine for Ankama's universes, has closely followed the news and what's going on behind the scenes of Season 3 with those who brought it to life. We'll review three issues that brought Season 3 to life inside. Yugo, Amalia, Percedal, Evangelyne, Ruel and many others will soon be back on your screens. To welcome your favorite adventurers in appropriate fashion, we pulled out all the stops: we completely recreated the website! Hurry to check it out! The Ankama Convention is a mixture of everything exciting, engaging, and artistic! Hundreds of computers for gaming, testing areas, chances to rub shoulders with the people who make Ankama what it is, it'll all be there! But there will also be surprises and entertainment, gifts and novelties! The Ankama Convention is always a special moment in the year and this 6th edition promises to be fabulous! We can't wait to see you there, so take a moment, head to the Ankama Convention site, book your pass and choose your side.... Rogues or Masqueraiders? If you want to preview the Rogue Class, you have two options: be a premium member and begin your Rogue adventure on January 18th, or grab a ROGUE PACK. But what is the Rogue Pack? Well, it’s one month’s subscription bundled together with a digital download of the exciting new Remington Comic in English. When you buy this pack, you’re also offered access to use the Rogue class on your account beginning December 15th! Christmas has come early! December has just started and your Christmas shopping has begun! Starting today, and throughout the month, you’ll receive a free Iop Strap with every order on the Ankama Shop website*! Your key ring, mobile phone or rucksack will be perfectly safe with a Iop guarding them! Mangas, soft toys, T-shirts… Check out our gift ideas and make someone smile this Christmas! Big surprises are in store for you in the next season of WAKFU the animated series, and even more are coming to theaters! The Odyssey of your favorite WAKFU heroes will be splashed across the big screen in 2014 with a feature-length film, currently under development in Ankama’s studios. If you are a fan of DOFUS, an animated adaptation of the game’s rich and fantastic adventures is also being created for television and film, coming in 2013. No one likes talking about going back to school, but we have to! Especially since this year, you’ll be able to show up to your new lessons with a smile on your face… and brand new DOFUS coloured equipment in your backpack! Pencil case, fountain and ball pens, folders or even the backpack itself: You’ll find everything you need for a great start to the new school year! Discover our new range of products online at Ankama Shop now! If you’re already a paid-up member of the Cult of the Cawwot and fluent in the language of the Wabbits, you’re definitely ready to welcome the band of Wabbits that have invaded Ankama Shop! You’ll love the Tiwabbit Tote Bag, as greedy as it is practical, and the Cawwot Pencil Case, that an obstinate Tiwabbit Wosungwee desperately clings to, and that you can take everywhere. And if you’re brave enough, challenge the Wo Wabbit and try to avoid his formidable teeth! You’ll find the Wabbits and all the other soft toys from the world of DOFUS on the Ankama Shop website! 10,000 years before DOFUS, the story of the Eliatropes was written amid the Chaos… A few months before Islands of Wakfu - Ankama’s first Xbox 360TM game - is released, find out more about the story of Nora and Efrim on its official website. Within a few weeks, a new account management service will be up and running... Soon you'll be able to recover your access info by SMS. We’ll soon be requesting that you certify your accounts again. How? By choosing a new secret question and associating a telephone number to your account. Why? Following the increase in Kama and equipment theft, we want to develop new solutions to fight these abuses. 1. Never lend your account to anyone, do not share accounts. 2. Never give out your password. 3. Do not buy Kamas or anything else on non-ANKAMA sites. If in doubt, please consult the list of trusted ANKAMA sites. Coming soon - detailed information on the implementation of SMS account management! Remember St. Ballotwine? There was a time when just hearing the name gave people a rash… a weird, pink one, at that! Although historians have lost all trace of the actual facts behind the legend, on that special day a few traditions remain. Something about the color pink… hearts… and enflamed declarations to the ones we love. To help you rekindle the flame of old times past, this weekend of Flovor 14th, the CUGAA (Commitee for the Unification of Governments of the Amaknan Archipelago) is offering St. Ballotwine Chocolates to all its World of Twelve citizens! An ideal gift to say how you feel to the one you love or to win over that special someone. Happy St. Ballotwine day! Tomorrow, on Tuesday, February 9th, 2010, there will be a special maintenance period for all Ankama sites in addition to the weekly DOFUS service update. All sites, games and mobile Ankama applications will be unavailable from 7:00 AM GMT+1 until 9:00 AM GMT+1. This service period will allow for an update of our databases and core code of our servers to improve their function and to prepare for the arrival of new features. - Premium Pass (5,000 copies available) - take part in both days of the convention and get a bag of collector’s goodies. - Day Pass - enjoy AC #5 on the day of your choice. - Accompanying Pass - for those who simply want to accompany their children. For each Day Pass or Premium Pass reserved, you’ll receive your choice of one of the following two pets: the Snow Bow Meow (DOFUS 2.0) or Walk (DOFUS 2.0 and 1.29). Check out the bag of collector’s goodies provided with the Premium Pass: A Snow Bow Meow soft toy, a Goultard phone strap, a Frigost mini-artbook... and plenty of other surprises to come! Brrrrr...! Sends a shiver down your spine, right? And this is only a taste of the frosty atmosphere that will descend on Paris, April 17 - 18... Find out more on the official Ankama Convention #5 website. The beta’s doors will be closed to new players as of Wednesday January 20, 2010. 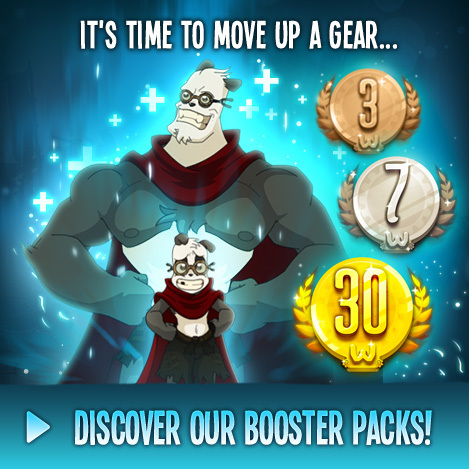 At this stage, it is difficult for new players not familiar with the DOFUS/Wakfu universe to grasp the final concepts of the game and have a global idea of what the game will be like in its final stages. That is why we decided to close the doors of the beta for the time being, until the game lives up to its reputation! But you need not worry we will not block the current Wakfu community! Those of you who have been with us since the beginning, who have been with us through the ups and downs – you are more than ever welcome ingame! You will still be able to connect to Wakfu after Patch 0,210 on January 20th if you have an active character today. Our desire to build a game for you and with you hasn’t changed! We will endeavor to work with you in that aspect and will continue on to collect your feedback and impressions on the game’s evolution. Just as everyone is wrapping up the last few presents and enjoying the holiday season with their family, Kwismas is arriving on Wakfu's shores. We wish you a very merry Kwismas and invite you to visit the Amaknan Archipelago starting December 25, where awesome presents will be waiting for you!